Charlie died on April 14th, 2017, Good Friday that year. I’ve struggled to find the good in that day, just as I struggle to rejoice in today’s celebrations. Today is Palm Sunday, the beginning of Holy week, the day Jesus rode into Jerusalem on a donkey while hundreds waved and laid palm branches on the road proclaiming Jesus as savior and King. It is the annual celebration of most important week in Christianity, but it also marks the second anniversary of Charlie’s death. I am torn between the emotions of celebration and sadness today. Year two for our family has been no less painful than the year of firsts. In fact, in many ways, it has been much harder. I continue to look for answers and comfort in the timing of Charlie’s death, seemingly always to surround the Easter season. Sometimes I wonder if it’s just a nasty coincidence and other times I believe there is comfort and healing, knowing that while I cry for my son, the Son of God who brings us eternal life, is using the timing of His ultimate sacrifice to remind me, that Charlie is not gone at all, but living joyfully in our true home, Heaven. There are several accounts of Palm Sunday in the Bible. Each one has its own small variances but the meaning is still very much in the same cadence. It has always seemed odd to me that Jesus rode in on a donkey. I don’t consider a donkey to be very regal, definitely not suitable for the King of kings. Why didn’t he ride in on a white horse, cloaked in armour and jewels in proclamation? Digging deeper into the analysis of scripture (again my fancy way of saying I googled it and read several theologians responses), donkeys were a symbol of peace in Biblical times. 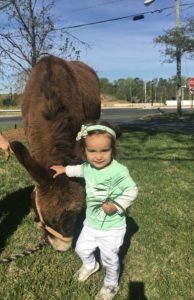 Choosing to ride a donkey not only fulfilled a prophecy of the Old Testament, but also showed Jesus’s intentions. His purpose was to bring peace to the world through the ultimate sacrifice of giving His life for our sins. I ask God to bring me and our family peace daily. That part of my prayer never changes. Although, I know God provides us the ultimate peace, sometimes it is hard for me to accept it. “Hosanna to the Son of David!” “Blessed is he who comes in the name of the Lord!“ “Hosanna in the highest heaven!” –Matthew 21:8-10. During Holy Week, we often sing or say as a congregation, “Hosanna in the highest” mimicking scripture describes. This phrase has passed my lips for 36 years, but I’m embarrassed to say, I am not sure what it really means. What is the definition of “Hosanna”? Hosanna is commonly defined as word describing praise or adoration. It totally makes sense to shout praise for the Son of God, especially as we are celebrating the greatest gift He gave us. But the literal translation (google research again) is “save us, we pray” or “save now” in another. Unlike us, the crowds that day were not aware that Jesus’s gift was yet to come. They assumed Jesus would be an earthly King, protecting and saving them here. I am not sure I am ever going to fully accept that my pleading with God that day did not work. But that is where faith comes in. Faith is choosing to believe in God, His goodness and His all knowing ability to do what is best regardless of my desire for the outcome to have been different. I believe that while Charlie’s earthly life was finished two years ago, his eternal life began. And in that, I know God’s greatest gift prevailed. So even as the tears stream down my face in church today, I will wave my palm branch and shout “Hosanna, Hosanna,” praising God for His grace. Because as hard as it is to live this Earthly life without Charlie, I know that God did save Charlie that day two years ago, in the greatest way—giving him eternal life.